The PS4 exclusive comes out in 2018. Back in the Dreamcast era, I fell in love with a game called Jet Set Radio. It was about a group of rollerbladers who leapt around a colorful, futuristic version of Tokyo spray-painting everything in sight. I consider it a classic and one of the best games Sega has ever published. Coincidentally, so does Dominic Robilliard, creative director of Sony studio PixelOpus. In fact, his first job in the games industry was at Sega, testing Jet Set Radio prior to its release. 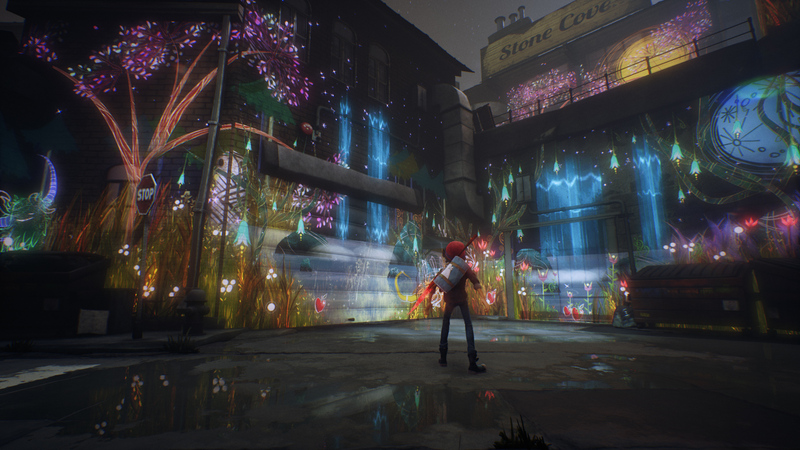 It's no surprise, then, to hear that his next game, Concrete Genie, is heavily inspired by the cel-shaded platformer. The PS4 title, unveiled at Paris Games Week, is about a young boy called Ash. He loves illustration and regularly doodles in his notebook. The story begins with a group of bullies stealing the book, tearing out the pages and scattering them across the city. Ash, undeterred, embarks on a quest to find them all and restore the notebook. Along the way, he discovers a paintbrush and the power to bring his creations to life. Suddenly, every building and back-alley is a canvas brimming with magical possibility. With these newfound abilities, Ash can draw moving landscapes and helpful creatures. But the bullies from before are still on the prowl, ready to pounce on Ash if they catch him trying to make the town a brighter, friendlier place. Just like Jet Set Radio, Ash must traverse the environment and leave his mark while avoiding these enemies. Should he be spotted, you can climb up onto the rooftops with an expansive set of parkour moves. He doesn't have rollerskates, but they're impressive all the same. 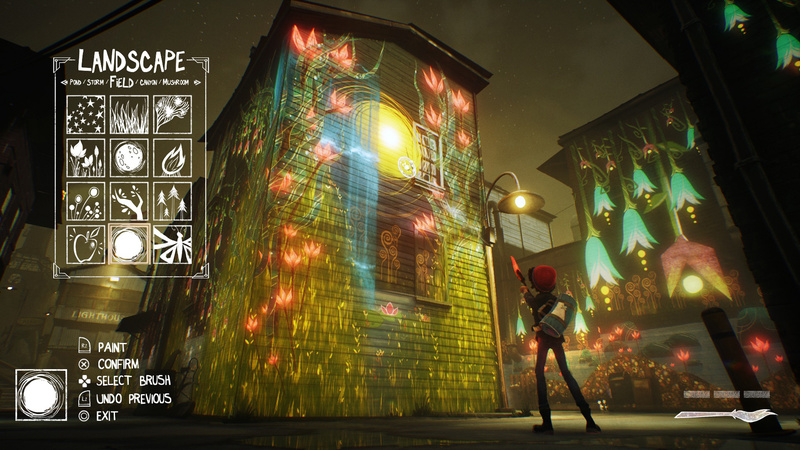 Concrete Genie, then, is part puzzler, part action-platformer. Ash lives in a small town called Denska which has been abandoned by most of its citizens and ravaged by pollution. It's a dark, gloomy place waiting to be lit up by Ash's glittering artwork. At the beginning, however, you'll only have access to a single neighborhood. Complete some puzzles, find a few pages and you'll unlock the next chapter and a new section of the town. Red brushes are associated with fire and can be used to burn down doors that have been boarded up. The general concept was partly inspired by one of the game's designers, who grew up in a fishing village in China. People were starting to leave the town and local children would paint in the streets to make them look more beautiful and lively. Robilliard had a similar experience in Bristol, England. There, the community would come together and clean large stretches of the town while graffiti artists taught residents how to paint those areas. "I found that to be really inspirational," Robilliard said. Throughout the game you'll acquire different "brushes." There will be roughly 50 in total, spread across five different colors. Each shade has an elemental property which can be utilized to affect the broader environment. Red brushes, for instance, are associated with fire and can be used to burn down doors that have been boarded up. As the game progresses, you'll need to combine the different brushes to proceed. All of the game's core puzzles have a set solution. Otherwise you're free to mess around and paint whatever you like. PixelOpus wants players to be creative and, like Ash, express themselves throughout the world. At any time you can walk up to a wall, look through your brushes and create a new mural. There's an on-screen cursor that you move with the DualShock 4's built-in motion controls, and a panel in the upper-left corner that shows your available brushes. Otherwise, it's simply R2 to paint and L2 to undo. You can move, resize and rotate pieces to come up with a unique design. Most brushes are like stickers, but others, Robilliard promises, will let you draw free-hand. So you can tag your name on a wall, or, if you lack imagination like me, create something obscene. (It's okay, every game with player-created content is ultimately filled with dong-shaped art or levels.) "With anything that has player created content, it's always out there like that," Robilliard said with a chuckle. "I'm not too worried about it." "There is no punishment for doing something wacky or bizarre." PixelOpus wants the game's art tools to be accessible. Everyone should be able to make something beautiful, regardless of their drawing skills in real life. The developer is, therefore, walking a tricky tightrope; it wants to amplify brushstrokes with dazzling and aesthetically consistent art, while staying true to the player's original inputs. There's a small disconnect between the buttons you press and what appears on screen. But ideally, you should be able to look at a wall and feel ownership over the different colors and shapes. "We've moved that 'slider' around to get the right balance between agency and assistance," Robilliard explained. Notably, your art will never be judged in-game. There's no star-rating for the murals you make, or a score that's handed out for covering the wall quickly. "There is no punishment for doing something wacky or bizarre," Robilliard said. "Some people on the team do very abstract things with these brushes, some of them let you put them upside down, things like that. But it's all part of exploring how the different brushes work." Outside of the puzzles, the art is for your own enjoyment and, possibly, other people. PixelOpus says it's working on a photo mode, albeit one with a twist. "We've got something a little different that we're hoping to develop," Robilliard hinted. "But we can't talk about it just yet." 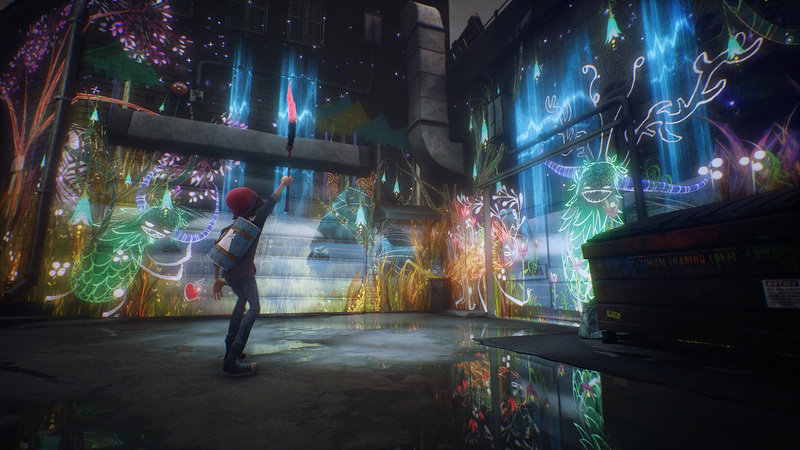 Concrete Genie deals with some fairly mature themes. At its core, the story is about bullying and the effect it has on people's ability to forge friendships and freely express themselves. The subject matter isn't unheard of for video games, but does need to be treated with the appropriate care and respect. PixelOpus says it's drawing on the experiences of its staff, at different ages, to craft a narrative and gameplay hooks that feel both "legitimate" and "authentic." "The stuff that Ash paints gets darker as he gets pushed around more and more." The brushes you pick up in Concrete Genie and, subsequently, the art you create will reflect the hero's emotional state. "So the stuff that he paints gets darker as he gets pushed around more and more," Robilliard explained. In addition, the roaming bullies will cause your artwork to die. Creatures will freeze in place and the colors will slowly ebb away, as if the life is being sucked out of them. The idea is that Ash's magical paintings are powered by imagination. The bullies don't have it, so as you run away the power to see and interact with these creations disappears too. When Ash's enemies ruin your artwork, it's supposed to feel painful. That's why the customization is so important — it's not just Ash's art, but your art that's being butchered. Naturally, you should feel the effects of bullying and better understand what the hero is going through in the story. "It's an interesting way for a game to make a player understand what that would feel like in a very personal way," Robilliard said. PixelOpus hopes the mature themes, and the general quality of the game, will appeal to a broad audience spanning all age groups. The street art and roaming bullies certainly evoke the Jet Set Radio I fell in love with 17 years ago. But there are flashes of Super Mario Sunshine, The Legend of Zelda: A Link Between Worlds, and countless other games that involve 3D platforming, cleaning and graffiti art. Furthermore, Robilliard says the team is interested in a co-op system similar to Super Mario Galaxy, which allowed a second player to wave a Wii remote at the screen and pick up helpful coins and power-ups. A co-operative painting mode, perhaps, or a feature that allows younger players to directly control the creatures? "It's a really good idea, and we are currently looking into that right now," Robilliard hinted. "I think there's quite a natural split in there that could be divided between two people, and in a really fun, accessible way." The developer has also hinted at another, more significant feature that could affect how you play the game. So far, everything we've seen shows a clear divide between the 3D world, where Ash lives, and the two-dimensional plane where his creations thrive. The monsters you make are effectively restricted to the buildings they were drawn on. But later in the game? Well, that might change. "They can go round corners, but they're landlocked," Robilliard said, before pausing for a moment. "Initially."